A lot of vegans will tout nutritional yeast as a good “natural” source of vitamin B12. What they don’t realize is that the B12 found in nutritional yeast is actually a supplement and NOT natural. Yeast, like plants, does NOT make vitamin B12. Only bacteria can produce B12. 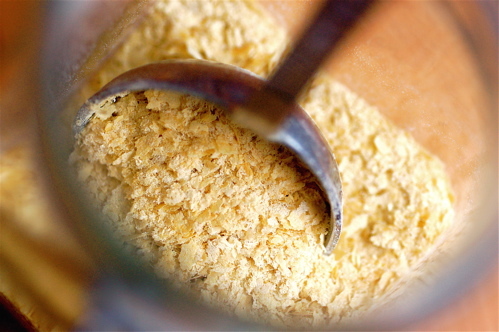 Theoretically, nutritional yeast could contain bacteria and thus have natural B12. However, nutritional yeast is grown in conditions in which bacteria is not allowed to grow (the yeast is also deactivated, so it won’t cause yeast infections). Since vegans are pretty much the only people who use nutritional yeast (and many are eating it because they mistakenly think it is a natural source of B12), most brands of nutritional yeast add B12 to the product. But don’t assume that all nutritional yeast contains B12! Make sure that you read the label and find out how much B12 is really in your nutritional yeast so you can make sure you are meeting the RDA for B12. For example: if you are eating Bob’s Red Mill Nutritional Yeast, you would need to eat 3 TBSP of it per day to meet your RDA. *The current RDA for B12 is 2.4 mcg daily (for healthy adults), though many experts are now pushing to increase the RDA to 4mcg daily. Aside from providing B12, fortified nutritional yeast is also a good source of nutrients like iron, potassium, selenium, amino acids, and other B vitamins. But, if you are one of those vegans who hates nutritional yeast, then don’t feel like you’ve got to eat the flaky stuff just to get your B12. A supplement will do the trick too. Check out our chart of vegan vitamins to find vegan B12 supplements. 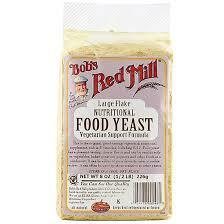 There are a lot of brands which make nutritional yeast. You can pick them up at places like Whole Foods. Bob’s Red Mill is the most popular and well-known brand, but is pretty pricey (especially if you use tons of nutritional yeast like I do). If you want to save money on nutritional yeast though, I’d recommend purchasing online instead. 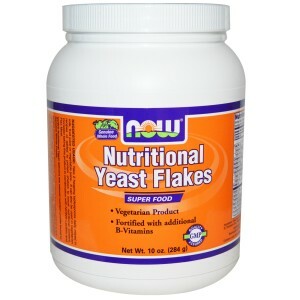 One of the best deals is Red Star Bulk Nutritional Yeast, which you can buy here.